Floor Scales Vs Platform Scales: Which is Best for Your Company? Differences Between Platform Scales and Floor Scales: Which is Best for Your Company? Is your company in need of an industrial scale but you’re not quite sure what to get? Whatever you need in an industrial scale, Arlyn Scales can make it—but first, let’s figure out exactly what it is you’re looking for. You most likely know the purpose of what your new scale will be, but there are a few further questions you must ask yourself if you want to get the perfect scale for your business. Take a look at the space in which the scale will be used—is it hazardous or safe? Is the area large or small? There are many factors that may alter the type of scale that you should purchase. For example, if your factory contains heavy amounts of dust or flammable material, then you need to buy an intrinsically safe scale that is made to meet the specific standards set for hazardous environments. If the items you plan on weighing are too heavy to be lifted manually, then you should look into buying a floor scale, and not a platform scale. Having a scale handy will allow your company to quickly and reliably measure any object that needs to be weighed. Ask yourself how often your business will use your new scale—how much of an investment are you willing to make to bring back the most reward? Arlyn Scales has the industrial scale that your business needs and we want to make sure that, in the end, you have the scale that is perfectly suited to your company’s needs—nothing more, nothing less. Do You Think You Need a Floor Scale? A floor scale is a great tool for measuring large loads that are too hefty to be lifted on the scale by hand. Most floor scales are equipped with on and off ramps that allow efficient loading and unloading. Floor scales are well suited for industrial environments like warehouses and factories. We manufacture a number of floor scales in various sizes and capacities, so whatever your need, we definitely have the machine for you. Every one of our scales is simple to use, guarantees accurate results and is suitable for tough environments—some more so than others. Our scales are available for purchase in steel, stainless steel, corrosion resistant and intrinsically safe options. Each scale is top of the line and Arlyn Scales can ship you your new scale straight from the factory, which means you get a great price. Arlyn Scales’ ArlynSeries 5200 Floor Scales are all equipped with stainless steel load cells, advanced digital algorithms and have welded construction that is coated with a special zinc rich epoxy for to prevent rust. The platform that is on all of our floor scales is very low so it is easy to place hard-to-lift objects on the scale to weigh. Each scale has a digital indicator on a swivel mount that is simple to operate and clearly legible. Our stainless steel floor scale is abuse resistant and a great fit for harsh industrial locations. This scale uses heavy-duty industrial grade load cells that are made from heat-treated stainless steel rather than aluminum or regular steel. The load cells are bolted into protection pockets within the frame. The zinc rich epoxy coating enhances strength, durability, accuracy and corrosion resistance. Arlyn Scales’ floor scales come in a multitude of sizes. Starting at 3’ x 3’ up to 8’ x 12’ and with capacities ranging from 2,500 pound to 30,000 pounds. If the environment that your scale will be working in is corrosive, see our corrosion resistant scale options here. If you have any questions on custom sizes, give us a call! All of our scales can connect with your computer through a variety of standard communication options, including: Ethernet, Wi-Fi, USB and RS-232 computer or printer port. Every scale that we make can be upgraded to include a rechargeable battery pack, setpoint controller for automation, time and date feature, and USB port. See our website for additional upgrades to enhance your scale today. We offer the ArlynGuard F scale as the intrinsically safe floor scale option for hazardous environments that involve flammable or explosive materials, including: fumes, liquids and high concentrations of dust. This scale is made of stainless steel and is prepared to withstand harsh elements in the work place. The price of this scale starts at $2,299. The ArlynGuard F can weigh 20,000 pounds and higher. Sensitivity available for this option can be as high as .5 pounds and the internal resolution is 1 of 500,000. The zinc rich epoxy prevents scratching and rusting. Is a Platform Scale What You Need? Platform scales are popular in the airline industry and commercial laundry businesses. This is the most commonly used scale in the manufacturing and agriculture industries because it is the perfect scale for weighing large objects that aren’t incredibly hard to lift or wheel up onto a platform. Perhaps a platform scale is the type of scale that your business needs. Arlyn Scales makes and sells quality industrial platform scales for every requirement your business may have. We sell platform scales in a variety of sizes ranging from 20” x 27” to 48” x 48”. We offer steel and aluminum platform scales, as well as intrinsically safe platform scales for hazardous environments. Each scale is manufactured for easy use. Equipped with 1” high graphics digital display and swivel mount, pushbutton functions for automatic and keyboard tare with 450 memory locations, and multiple units conversion, the price of our aluminum platform scale begins at $699 and the starting price of our stainless steel platform scale is $999. 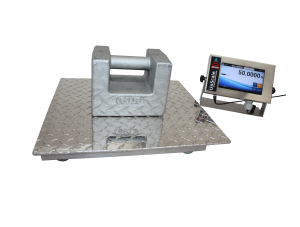 Our stainless steel platform scales utilize industry standard technology and stainless steel load cells that allow the scale to endure tough environments while maintaining accuracy. Internal resolution is 1 part in 500,000 and weight resolution up to .1 pounds. Arlyn Scales’ ArlynGuard P scale starts at $1699 and is made to withstand industrial environments that prohibit the use of standard equipment because of the use of explosive, flammable or other hazardous conditions. Our scales that are deemed intrinsically safe are suitable for Class I, II, III, Division 1, Groups A, B, C, D, E, F & G.
All of our scales have multiple connectivity options, including: Ethernet, Wi-Fi, USB and RS-232 computer or printer port. Every scale can be upgraded to include a number of features that do not come on the standard scales that we make. Additional upgrades are the same available to our floor scales. There are many sizes available in our platform scales and there are many options available to you and your business needs. Learn More About Our Floor and Platform Scales, Call Arlyn Scales Today! If you have a heavy load to weigh and are looking for the perfect scale to purchase to help your company get the job done and function more efficiently, then give Arlyn Scales a call today at 800-645-4301 to talk to a knowledgeable staff member that is prepared to help you find the scale that is right for you. You can also visit our website to learn more about the scales that we make and learn more about Arlyn Scales.